The Aperol Spritz has its history firmly planted in Northern Italy where it is mainly drunk as an aperitif. Aperol itself is an infusion of herbs and roots with the two most prominent flavours being orange and rhubarb. How to make the perfect Aperol Spritz 1. Fill a wine glass generously with cubed ice 2. Add 3 measures (75ml) of Prosecco over the ice 3. Add 2 measures (50ml) of Aperol 4. Finish with a dash of soda water 5. Garnish with a slice of orange. Our Aperol Spritz cocktail gift pack contains a full size bottle of our gorgeous tasting Prosecco together with a bottle of Aperol, allowing you to make this great simple drink over and over again! 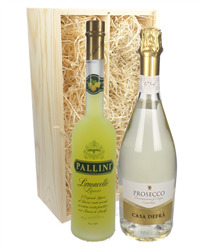 Send a beautiful liqueur gift of two bottles in one of our presentation wooden boxes. Choose a two bottle liqueur gifts from our range of liqueurs such as Kahlua, Baileys, Jagermeister and many more. Order online or by phone and we will deliver direct to the address of your choice, carefully packaged with your special gift message.